You’ve heard a lot of reasons that unemployment is still above 8% right now, and there are probably hundreds of factors, large and small. The crisis in Europe is certainly a big one – American businesses are actually exporting less to Europe than they were 4 years ago. Consumer confidence is still relatively low – that isn’t helping, especially in big-ticket industries like home construction, real estate and auto. Some folks feel over-regulation may be a factor in certain sectors – energy or finance, for example – but those sectors aren’t hurting worse than others where regulation hasn’t been changed recently. Companies won’t hire if they don’t need more people in order to make big profits. It’s not that American businesses have stopped being productive – the overall GDP of the U.S. has actually grown by 8% over the past 2 years, according to the World Bank. We’re still making a lot of “stuff” (tangible and otherwise). It’s that we need fewer workers to produce it. That’s seriously impressive. 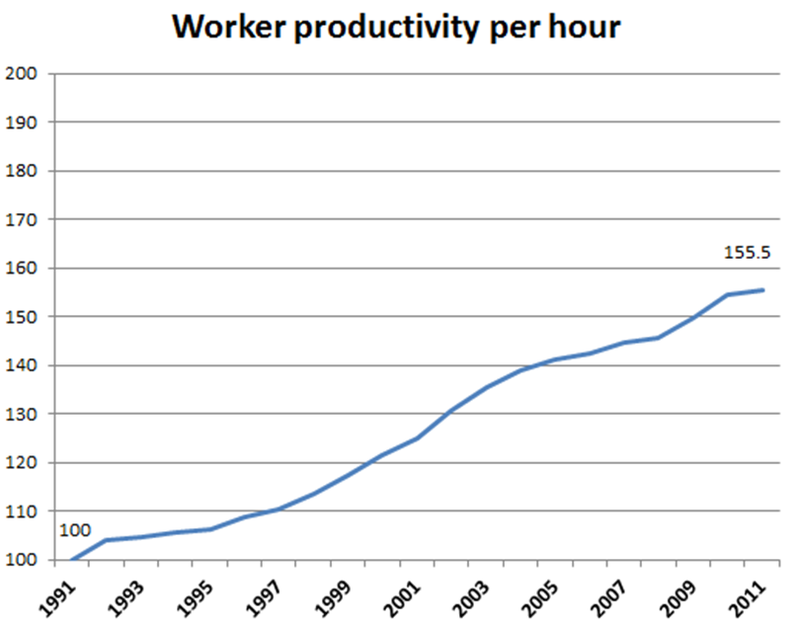 Thanks to better technology, processes, training, global competition, and presumably increased pressure from their employers, American workers produce 55% more per hour than they did 20 years ago. 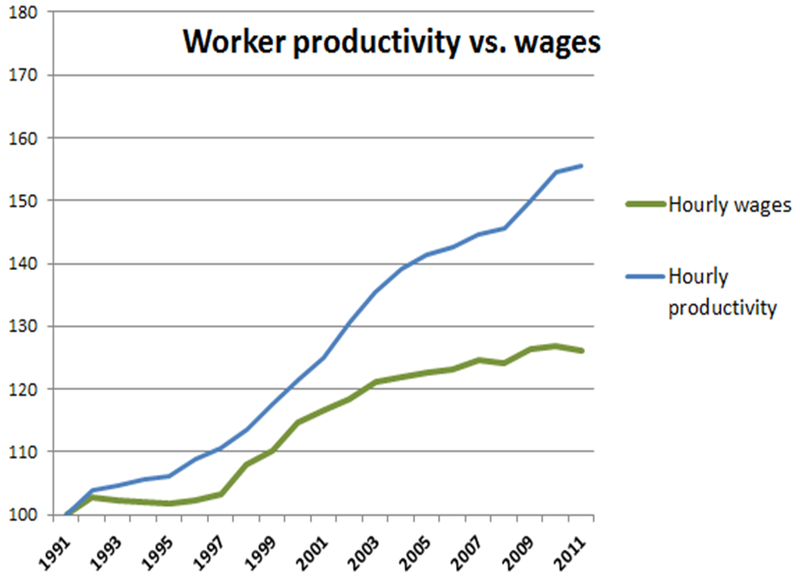 Hourly wages have grown by 27% over that same period – less than half as much as productivity growth. Basically, the supply-demand equation between employers and the labor force has swung dramatically in favor of companies. Firms are producing more – but they’re doing it more efficiently, which means they don’t need as many workers. So there’s more competition for jobs, and more downward pressure on wages. Remember, it’s not like companies don’t have the money to hire. The ten most profitable companies in the Fortune 500 made combined profits last year of – might want to sit down for this one – $220 billion. Obviously, a fraction of those profits could’ve paid for millions of jobs. But why would those companies hire when they don’t need to? They’re public companies, and their shareholders demand that they maximize the return on their investment. So that’s what they’re doing – making tons of money, compensating their top performers very well because they need them to keep profitability going, and reducing costs throughout the rest of their organizations. And, not hiring much. Export more. This is an awesome idea, except that the rest of the world isn’t really cooperating right now. No one expects Europe to escape their doldrums for another few years, and even after that, it’s unclear if their levels of consumption and investment will recover fully. Our overall exports are up, thanks to China, Latin America, and Africa, but that modest growth isn’t driving factories and offices to increase staff significantly (not yet, anyway). Convince Americans to buy more. Given our collective levels of credit card debt (a little over $750 billion, according to the Federal Reserve), I’m not sure how much more we can safely consume. Rich Americans have the disposable income to spend more, but presumably they (or their financial advisers) are smart enough to invest that extra money instead. Invest in high-potential areas. Now we’re talking. If we can increase the overall size of the GDP pie through innovation in new areas, that could create sustainable long-term jobs. Historically, this type of innovation has usually been kick-started by the government, and then brought to private-sector uses. When DARPA supported the creation of the original Internet, entrepreneurs eventually found ways to use that research and technology to create millions of new jobs (and countless product innovations). Same with NASA and the space program. The only downsides to this strategy? It takes time, and it takes significant initial investment. Do we have the collective patience to see these sorts of programs through? Public-sector spending. Have governments (federal and state) directly hire people to rebuild infrastructure, educate our kids in innovative ways, and take care of our growing elderly population (to pick an example or three). Or have governments make deals with private companies to outsource that work. Depending on your political bent, this is either a really compelling short-term idea, or the death of our capitalist values. Maybe both. One last point: there’s no gravitational pull towards our previous 5% unemployment rates. We’re not guaranteed of ever returning to those levels. If we want to get there, we have to change. Previous Post What are large companies really paying in taxes?